(Last Updated : 05.12.18). UPTET Answer Key 2018 TET Exam Result - Uttar Pradesh Basic Education Board has released Result of UP TET 2018 Exam held in November, 2018 for both levels (Primary & Upper Primary). The TET Exam was held on 18th November 2018 instead of 4th November 2018. The Answer Key of UPTET 2018 can be downloaded from the official website. UP TET Exam Notification 2018 was released on 15 September, 2018 as per the schedule on the official website of UP Teachers Eligibility Test 2018 i.e. www.upbasiceduboard.gov.in. Online application for UP TET 2018 were invited from 18.09.2018 to 04.10.2018 (extended up to 07.10.2018). Separate links for Primary & Upper Primary Admit Card (District-wise) may be released for UP TET Exam 2018. Official and Unofficial Answer Key of Uttar Pradesh TET 2018 exam result will be available here. Get here full details of Uttar Pradesh TET 2018 - Online Application, Syllabus, Exam Schedule, Admit Card, Answer Key, Question Paper, Result & Practice Papers/sets. UPTET 2018 Latest News 05.12.2018 : Latest News about UP TET Exam 2018 is that UP TET Result 2018 is available now to download for TET Exam 2018. Here you can check new and updated online links for registration. The notification is available on the website upbasiceduboard.gov.in. Candidates can download TET Exam Notification and apply for UPTET 2018 here whose links are given here. The Result of UP TET 2018 exam November was scheduled to be declared on 20.11.2018. Eligible candidates can download their result of UP TET 2018 through official link of UP TET 2018. Visit official website of UP TET. Enter your Roll Number and Security Code. Answer key of UPTET 2018 Exam are available here after the exam. Official & Revised Answer key of UPTET 2018 has been released as per the schedule on the official website. Final Answer Keys will be uploaded as per schedule. You can get here tentative and unofficial answer key of UP TET November 2018. Download UP TET Answer Key 2018 under these categories at the below links. 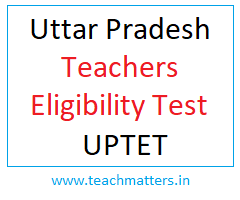 Uttar Pradesh Teacher Eligibility Test (UPTET) 2018 will be held on 18 November, 2018 for Level-1 & Level-2. Candidates who have applied successfully for UPTET 2018 Exam will be allowed to download UP TET Admit Card 2018 as per the schedule. Here is detailed schedule of UPTET Exam 2018 Admit Card. Candidates can download their admit card as per the schedule (w.e.f. 30.10.2018 instead of 19.10.2018) for both levels - Level-1 & Level-2. Admit cards have been issued only to those candidates who have successfully applied for the exam. UP TET Admit Card 2018 are available now to download with separate links for Primary Level and Upper Primary Level (District-Wise) and can be downloaded from the official website of UP TET i.e. www.upbasiceduboard.gov.in. Note : UPTET Admit Cards 2018 are available now to download. Download from the below link. Uttar Pradesh Basic Education Board has released Notification for UP TET 2018 on 15.09.2018. Online registration/application for UPTET 2018 was started from 18th September, 2018 and last date was extended up to 07.10.2018. Online Corrections in Particulars of UPTET 2018 can be completed as per the schedule. Eligible and interested candidates can apply online for UP Teachers Eligibility Test 2018 as per the schedule through the official website i.e. www.upbasiceduboard.gov.in. Read Important Instructions for Online Registration of UP TET 2018. Online Registration for UP TET Application 2018. Submit fee and Print e-challan through Bank Link. Print your filled Application Form. Candidates who are going to participate in UP TET 2018 are advised to go through the syllabus of UP TET 2018 Exam to be held in 2018. UP TET Syllabus 2015 is available for all levels - Level-1 (class 1st to 5th Primary Teacher) & Level-2 (class 6th to 8th School Teacher / Master). The UP TET 2018 Syllabus is available on the official website of the Board. Candidate can download UPTET Syllabus 2018 from the website. Download free practice papers / sets or study notes for UP TET 2018 here. UPTET 2018 Practice Papers are with question answers in both language - Hindi & English. Objective type pedagogy MCQ questions in Hindi are available here for download. English Grammar, Hindi Grammar & Child Development and Pedagogy Notes in Hindi for UP TET are very useful for the students of UP TET 2018. Download Pedagogy / Psychology Notes in Hindi for UP TET 2018.